10pc Stainless Steel Bowl Set only $5! Here's another great Saveology you can get right now. 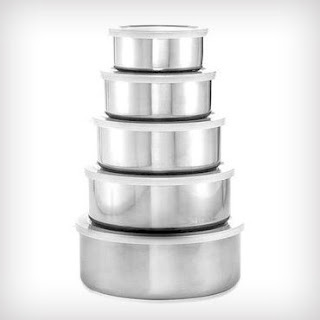 For $5, you can get a 10-piece (5 bowls, 5 lids) stainless steel storage set! Each bowl includes a plastic lid that snaps on to form an airtight seal to keep food fresh and easily stores leftovers. Plus they're fridge, freezer, and dishwasher safe, and they stack together for easy storage when not in use. Shipping is an additional $3, but in my opinion, $8 shipped is still a great price for this set.